I was a child who needed to know fairyland. Andrew Lang took me there by way of his wonderful, coloured fairy tales, so did the Brothers Grimm, but nowhere was I more at home than with Diamond in At the Back of the North Wind or with The Golden Key of George MacDonald in my hand. Thus it was that when I was given the chance to write about MacDonald (The Gold Key and the Green Life, Constable 1986) and find out what motivated him and where his marvellous ability to recreate fairyland came from, I accepted with joy. Three themes dominated his life and works. Firstly, a constant awareness of death. His earliest conscious memory was when, in 1826, at the age of two, he watched the Duke of Gordon’s splendid funeral procession through his home town of Huntly – a prophetic image indeed for death by tuberculosis; that ‘constant attendant’, as he called it, was to haunt his long, eventful life. His beautiful Highland mother died of it when he was only eight, and so in time did his father, three brothers, a stepsister, his mother-in-law and four of his own eleven children. Though he lived for eighty-one years his health was plagued with pleurisy, bronchitis, eczema, asthma and bleeding from the lungs. ‘I wis’ we were a’ deid,’ he would say wistfully as a boy, for in heaven there could be no more separation by death. Tolkien has written ‘Death is the theme that most inspired George MacDonald’. But not death as the Victorian writers usually portrayed it. To MacDonald, death was not a problem. Death was what gave meaning to human existence, the culmination of life. The last chapter of his first fantasy novel, Phantastes, is headed, ‘Our life is no dream but it ought to become one, and perhaps will’. This sums up not only the content of the book but also his philosophy of life. Equally, he was dominated by a deep devotion and commitment to non-doctrinaire Christianity. After a short period at Highbury Theological College in London, he was ordained in his first and only charge at the Congregational Church in Arundel in 1850. There his unconventional views on sabbath observance and compulsory church attendance, his hope that animals might have a part in heaven and that the heathen be given another chance after death, led to accusations that his doctrine was unsound. A year later he left the established ministry though he continued to preach when asked to do so. Freedom to choose between good and evil dominated Macdonald’s theology. Though fully aware that not all men are good, he saw God in the beauty of the natural world, in the beauty of the human face however scarred with suffering, poverty or age and above all in the beauty of love. After leaving the ministry George MacDonald turned to writing not just to make a living, though that was an important reason for a man with a large family, but also as a way of preaching the Gospel of Christ. He believed he could reach a far wider audience with the pen than in the pulpit. All MacDonald’s major characters are guided by a strong sense of duty, but what he meant by duty was not judgemental and harsh but rather love in action, often lightened by laughter. The third influence in his life was his pride in his Celtic origins. ‘Surely,’ he once wrote in a letter to the Spectator, ‘it is one of the worst signs of a man to turn his back upon the rock whence he was hewn.’ For him, that rock was Gaeldom. Descended from the MacDonalds of Glencoe, his Gaelic-speaking great-grandfather escaped with his infant son from the bloody aftermath of Culloden to take refuge in the caves of Portsoy where he eventually became town piper. The son prospered and earned a partnership in one of the largest bleaching fields in Huntly. Three of his four grandsons leased the farm of Upper Pirriesmill from the Duke of Gordon and it was here that his great-grandson, young George, second of six brothers, spent most of his childhood. It is still a lovely house, with George’s attic window overlooking green and windswept hills. The old bleaching fields, now crossed by the railway, still stretch down to the coiling, wooded river Bogie where the MacDonald boys played. At night around the fireside they listened, enthralled, to Celtic tales told in the oral tradition of fairies, witches, monsters and ghosts. These were the food on which his imagination thrived, these the basis of his own fairy-tales for children and fantasies for adults. The landscapes of Phantastes, the fairy wise women, the tree spirits and talking creatures, its magic and its terrors are all drawn from the familiar world of Celtic folklore. George MacDonald’s appearance proclaimed the Celtic love of finery. His son Greville, in his definitive and affectionate biography George MacDonald and his Wife (Allen and Unwin, 1924), records that all his life his ‘father’s dress was more or less a protest against the ugly and unreasonable’. Six foot tall, broad-shouldered, strikingly handsome with astonishing blue eyes, he drew admiring crowds as he strode down a London street in full Highland dress, his plaid fastened to his shoulder with a topaz. A Chicago journalist wrote of ‘his diamond pins, jewelled shirt-studs, massive watch chains, daintily shod feet and Christlike countenance’, all worn without vanity but with immense enjoyment. He grew a beard, black in youth, white in age. The sculptor Alexander Munro, watching him come indoors on a windy day ‘with his thick curly hair blowing all about him’, modelled a medallion of him on the spot which was later cast in bronze. George MacDonald’s circle of friends was widespread and included literary figures on both sides of the Atlantic such as his patroness the philanthropist Lady Noel Byron (widow of the poet), John Ruskin, Alfred Lord Tennyson, Lewis Carroll – Uncle Dodgson to his children – Mark Twain, Emerson and Longfellow. But of all the many friends and relations who influenced him most, his father probably came first. He once wrote to his much-loved and talented wife Louisa, ‘How careful my dear father is of everyone… I think there is scarcely one other manly straightforward man to equal my father.’ When his father died in 1858 George wrote to Louisa, ‘You would almost fancy he had been a kind of chief of the clan… I am glad my father has got through. I love him more than ever’. If a child’s first understanding of God comes from his relationship with his father, then George MacDonald senior was perhaps the most important earthly figure in his son’s life. Nowhere is his father’s influence seen more than in his numerous non-fantasy novels, which were hugely popular during his lifetime. There the three aspects of fatherhood in the Celtic clan system – human, divine and a combination of the two – shine clearly: the chief, as both father and king, is divinely inaugurated. These are strong stories with good plots, laced with humour and threaded throughout with wisdom. Though perhaps a little long-winded and sentimental for today’s taste they are still enjoyable to read. G.K.Chesterton records, ‘He wrote nothing empty, but he wrote much that is rather too full’. It is however in his fantasy novels that George MacDonald excels both as teacher and entertainer. Here the dominant themes of death, Christian love and the Celtic imagination speak to the reader in a way that his ‘straight’ novels can never do and more than fulfil the author’s ambition to preach the Gospel of love and survival. His fantasies divide into two groups: his fairytales for children and his two great adult works Phantastes and Lilith. Interestingly enough, in these books the male figure dwindles to insignificance and woman dominates in the threefold role of the Celtic triple goddess, pure and perfect, nurturer and sage, flirt and hag. Here too the prototypes can be clearly seen in his lost young mother, his formidable grandmother and his nurturing wife. It has been suggested that the flirt may have originated in a young woman he fell in love with as a student doing a holiday job in Caithness. Greville MacDonald records that he met her ‘in a certain castle or mansion in the far North, the locality of which I have failed to trace’. Probably she was beautiful, no doubt she enjoyed flirting with the penniless student but had no intention of marrying a farmer’s son. As a result his Celtic pride was bruised and she came subconsciously to represent all the wicked women in his fiction, culminating in Lilith, Adam’s first wife, whose hatred led her to destroy her own children. Both Phantastes and Lilith are allegories that take their heroes from life into death and beyond, but where in Phantastes the theme is the pursuit of love and heaven, Lilith is altogether more complicated, concerned with the nature of evil and hell. It is a deeply dark book written in old age that took six attempts to write and you either love it or hate it for the starkness of its imagery. Louisa hated it so much that George asked Greville to arbitrate over its publiction. Fortunately he considered it to be his father’s greatest work and called it ‘the Revelation of St George’. 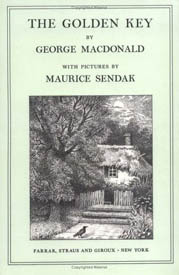 But it is for his children’s stories that George MacDonald is best remembered today and that should not be surprising. All his life he loved young people and was at his best with children. J.M. Bulloch quotes him as saying ‘he who will be a man and will not be a child, must – he cannot help himself – become a little man’. He never lost his own child-heart and fascination for the world of Faerie. A hypnotic story-teller, he also enjoyed the fun of family life. Sir Johnston Forbes-Robertson remembered the children’s parties in his London home, The Retreat (later to be called Kelmscott House and associated with William Morris), ‘how he used to cover himself with a skin rug and pretend to be a bear, to the great delight of us all’. 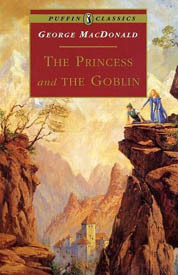 Best known and most often republished among his children’s fairy allegories are At the Back of the North Wind (1871), The Princess and the Goblin (1872) and The Princess and Curdie (1883). 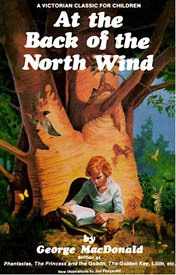 No child was expected to look behind the adventures and find, for example, the message that the mysterious North Wind is a divine figure who sweeps away a soul to give him a taste of heaven, and that the boy Diamond responds to that inspiration with complete trust in her love. Yet all children sense the goodness and wholesomeness of the stories. My own favourite of all the allegories, The Golden Key, first appeared in 1867 in a collection of children’s tales called Dealings with the Fairies. It is that special delight, a story which appeals equally to children and adults, though obviously at different levels. 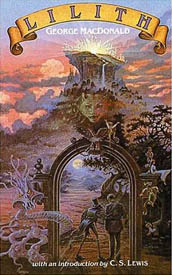 The child reads it as the adventures of two children, Mossy and Tangle, who find a gold key and travel through fairyland in search of the lock. At a deeper level it may be seen as the journey of a man and wife through life into death and beyond. Many writers including C.S. Lewis and W.H. Auden have made their own interpretations of the allegory and all are worth studying. Briefly, the gold key which the boy Mossy finds at the foot of the rainbow represents the gift of love to be found to a greater or lesser degree in all men. It has also been compared (R.L. Wolff) to the male phallus and that analogy is worth following throughout the story. The quest is for the key-hole, or the completion of love, human and divine, to be found in ‘the land from whence the shadows fall’. This image was later to be interpreted by C.S. Lewis as the Shadow-lands. The wise and beautiful grandmother, a familiar figure in all MacDonald’s fantasies, is Mother-Earth. She prepares the children for their journey through life. Her feathered fishes, a wonderfully creative image, who crave to be eaten so they may attain a higher life form as guardian angels, remind Christians of Holy Communion, the sacrament that provides sustenance for the soul on its journey through life. The whole concept of time is traditionally different in fairyland. Mossy and Tangle enjoy their youth in an enchanted forest where the birds and beasts, like human friends, are either generous or mean. Leaving the forest, they struggle through dark tunnels or climb precipices which represent the trials of marriage and middle age. Later they descend to the great plains of age where they are haunted by tantalising and beautiful shadows which seem to reflect a brighter world. Stairs beside stairs wound up together; and beautiful beings of all ages climbed along with them. They knew they were going up to the country whence the shadows fall. By this time I think they must have got there. ‘Corage! God mend Al!’ was George MacDonald’s own anagram of his name. It is apt, for the great Celt was indeed a courageous man in the face of illness, poverty and death and in his attempts to moderate the Calvinism of the day, to enlighten souls and to practise his high ideals. George MacDonald’s forty-eight complete works and two biographies of him, by Greville MacDonald and Rolland Hein, are published by Johannesen, Whitethorn, California 95589, USA. Email: johannesenahumboldt.net Website: www.johannesen.com The George MacDonald Society produces regular newsletters and an academic journal entitled North Wind. Contact Vivienne Forrest, 13 New Wynd, Montrose, DD10 8RB. At the Back of the North Wind was first serialised in the journal Good Words for the Young, 1869. Four illustrations for the story by its first illustrator, Arthur Hughes, are reproduced on pages 24-25. 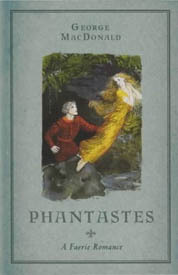 MacDonald believed that Hughes was in tune with the spirit of his fairy and fantasy writing.